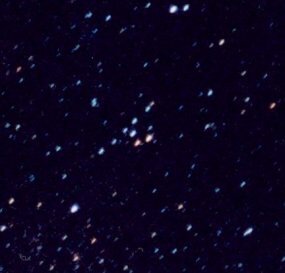 The "Coathanger Cluster" (also known as Brocchi's Cluster and more formally as Collinder 399) is an almost startling sight when encountered in the view of a small telescope. Visible to the naked eye in the constellation Vulpecula, three of the stars even have Flamsteed numbers. Commonly taken as a real cluster, it isn't, and thereby provides a strong lesson about statistics and about the difficulties inherent in cluster research. The grouping, in the heart of the Milky Way, is entirely a coincidence. Its stars range from 200 to 1100 light years away. Moreover, the stars are not moving together, but are going off in all sorts of different directions. One of the most difficult tasks in dealing with real clusters is "membership." What stars really belong, and what stars are just in the way? The only way to tell is through time-consuming measures of distance and motion. Nevertheless, the "group," with its strong color contrasts (caused by differing temperatures, cooler stars more red), is quite lovely to look at. For more information, see Brian Skiff's article in the January 1998 edition of Sky and Telescope, where the non-cluster status of the Coathanger was first brought to light.